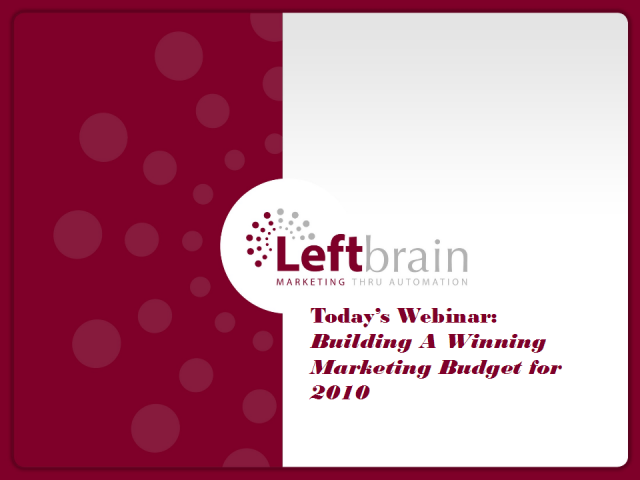 It’s not too late to infuse your 2010 marketing budget with some winning strategies used by our panel of marketing experts. Join DemandGen Report for this live, interactive webinar and hear from industry experts Gary Damiano, VP of Field Marketing at Composite Software; Andrew Gaffney, Editor and Publisher at DemandGen Report; and Malcolm Friedberg, Principal at Left Brain Marketing, as they discuss how to create a marketing budget can significantly impact your organization in 2010. This 45 minute webinar will help Marketers with long sales cycles, complex sales and Enterprise clients understand how marketing automation can be a highly effective tool for lead generation. Malcolm Friedberg and David Rodnitzky will discuss how automation applies to lead gen, PPC adversting and everything tied to converting your leads. Left Brain Marketing and Marketbright have teamed up to help you ask the right questions during the marketing automation vendor selection process to find the right match. Join us for this one hour webinar where we will show you how finding the right vendor will increase productivity and reduce costs. Inbound marketing is critical, but it's just the beginning of the process. What's your gameplan for converting all those new leads? Hear proven strategies that companies like Apple, Citrix Online and many others are using to maximize their incoming leads. Marketing automation is a powerful tool for marketers, but its only beginning to establish itself in the marketplace. If you're new to the space, this channel will help you decide whether automation makes sense for your company. If you're currently using a system, it's a place to exchange ideas and information with other experienced marketers.